Pads are attached to the discs on the grinding machine. The smaller is the abrasive grain, the less rough is the surface after being processed. 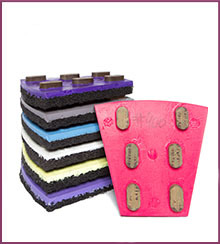 Pads with the smallest grains can make a glossy surface. For effective use it is important to take into consideration the stiffness of pads and the concrete grade. Pads are divided by its stiffness (color) – for hard concrete (red), for medium concrete (green), for soft concrete (blue). 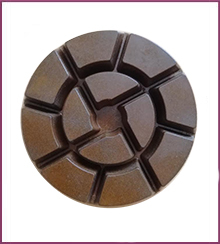 To increase the resource of diamond pad 1,5-2 times, all pads are available with one or two diamond segments. 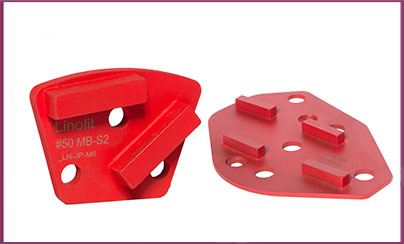 Polymer – for polishing, they are being used together with chemical compounds «Linolit». Pads are divided by its stiffness (color) – for hard concrete (red), for medium concrete (green), for soft concrete (blue). After having completed two stages of grinding, the surface is ready for polishing. 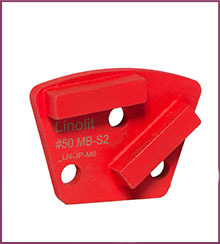 Polymer - for polishing, they are being used together with chemical compounds «Linolit».